National Shrine of Our Lady of El Cisne (Nuestra Señora de el Cisne), in El Cisne, Loja, Ecuador. Autonomous Monastic State of the Holy Mountain, Mount Athos, Greece; the Mother of God is the only woman allowed. The Basilica of the Virgin of the Rosary (Temple of Santo Domingo). Guatemala city. The Virgin of Carmel Sanctuary. Guatemala city. The Abbey of the Dormition, also known as Church of the Dormition of Our Lady on Mount Zion, in Jerusalem. Miraculous Icon of Our Lady of Tartaków in Blessed Virgin Mary Queen of Poland Church in Łukawiec. Bochnia Church of St. Nicholas Icon of Our Lady from the 15th-16th century, crowned in 1931. Stara Błotnica Church of the Immaculate Conception Icon of Our Lady from the 16th century crowned in 1977. The Sanctuary of Our Lady of Fátima, in Portugal, is one of the most famous Marian shrines in the world. For a complete list and further reading, see footnotes. See also: List of shrines#United States. Our Lady of Lourdes Belmont Abbey, Charlotte, North Carolina. Wikimedia Commons has media related to Marian shrines. ^ Marian Shrines in Canada webpage. The Marian Library/International Marian Research Institute, Dayton, Ohio, US. Retrieved 10 October 2010. ^ "Official website of the National Shrine of Our Lady of El Cisne". Retrieved 21 December 2008. ^ "Shrines in India : University of Dayton, Ohio". Udayton.edu. 11 February 2019. ^ "Miracle draws huge crowd to Manarcad Church". News18. 28 February 2012. ^ ""Holy Soonoro (Holy Girdle) of our Mother" (Discovery)". Mgocsmdiaspora.org. 14 August 2014. ^ "Missionaries of the Divine Revelation". Divinarivelazione.org. Archived from the original on 4 July 2008. Retrieved 6 May 2009. ^ "Zgodovina cerkve | Marijino svetišče na Zaplazu". Zaplaz.si. Retrieved 1 March 2019. ^ "Sveta Gora - dobrodošli - Zgodovina Svete Gore". Svetagora.si. Retrieved 1 March 2019. ^ "Suffolk Churches site". Suffolkchurches.co.uk. Retrieved 1 March 2019. ^ View of the two Walsingham shrines on their joint website. ^ "St Mary's Willesden-Shrine of Our Lady of Willesden". stmarywillesden. ^ "Our Lady of Willesden - Roman Catholic Church of Our Lady of Willesden". ^ "SHRINE OF THE MIRACULOUS RELIC IMAGE OF OUR LADY OF GUADALUPE". 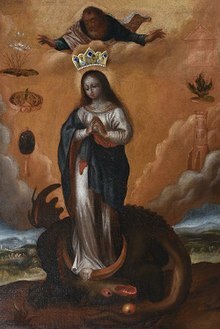 www.relicourladyofguadalupe.co.uk. ^ Warwick Street Church, London W1, displaying a sign "Church of the Assumption"; Lady Chapel; The shrine of Our Lady of Guadalupe The Holy Child & St Joseph Bedford MK40 1HU www.relicofourladyofguadalupe.co.uk Grant of Indulgence (Summary of the Decree of Pope Pius IX, promulgated 15 May 1877, remaining in force in perpetuity). 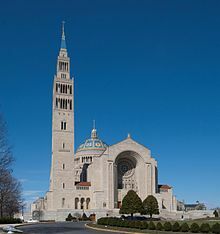 ^ Marian Shrines in the United States webpage. The Marian Library/International Marian Research Institute, Dayton, Ohio. Retrieved 10 October 2010. ^ For further reading, see Marian Shrines of the United States: A Pilgrim's Travel Guide (Liguori Publications). ^ O'Neill, Eddie (1 January 2017). "Motherly Welcome in Missouri: A Visit to the National Shrine of Mary, Mother of the Church". National Catholic Register. Retrieved 1 January 2017. ^ "Visitors to Belmont Abbey". Belmontabbeycollege.edu. 27 March 2014. Retrieved 1 March 2019. ^ "Our Lady of the Roses Mary Help of Mothers - The Official Site". www.ourladyoftheroses.org.